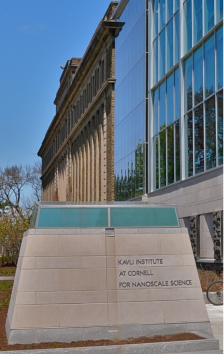 The Kavli Institute at Cornell (KIC) is devoted to the development and utilization of next-generation tools for exploring the nanoscale world. KIC creates new techniques to image and dynamically control nanoscale systems and uses these techniques to push the frontiers of nanoscale science. KIC’s measurement-oriented mission complements existing strengths at Cornell in nanofabrication. Open to all members of the Cornell nano community,KIC funds small, innovative teams to develop cross-cutting approaches to science at the boundaries of nanoscale imaging, manipulation, and control. These come in two types, Fellow Projects and Instrumentation Projects. They will typically involve faculty both within and outside KIC. High risk, high payoff projects will be strongly encouraged. KIC is housed in the new Physical Sciences Building. Labs are on the basement level, and Director’s office and conference room are located on the 4th Floor. The instrumentation in the KIC Facility is available to the entire Cornell community, and uniform user fees will be charged. Please click here for a complete list of University Policies.